'Location Is Everything' In Tribal Casino Dispute The dispute between two Native American tribes comes down to historical claims on a casino's proposed site — and also business. 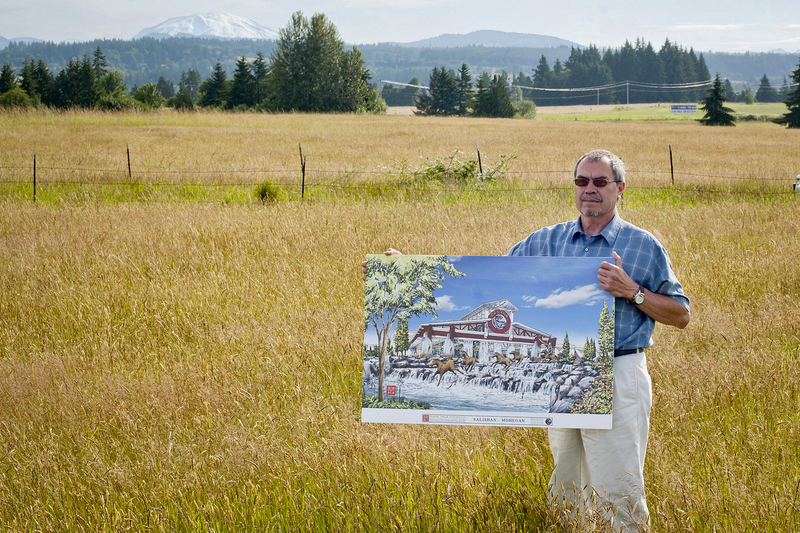 Tribal Chairman Bill Iyall stands on Cowlitz Tribe reservation land with a rendering of the casino the tribe hopes to build on the site near La Center, Washington, just north of Portland, Ore. Fewer than 20 miles north of Portland, Ore., off Interstate 5 in southwest Washington state, sits a 150-acre former dairy farm. The Cowlitz Indian Tribe eyed the grassy field as the future home of a casino, and a developer purchased the land for the tribe more than a decade ago. "It will be a good attraction for the whole community here, drawing thousands of people daily but also providing thousands of jobs," says Bill Iyall, the Cowlitz tribal chairman. Late last year, a district court judge ruled in favor of the Cowlitz, clearing the way for them to start construction, but another tribe — the Confederated Tribes of Grand Ronde — appealed that decision. Despite the litigation, the Department of Interior took the 150-acre field into trust for the Cowlitz in March. The Grand Ronde argue the Cowlitz shouldn't be allowed to build their proposed casino there because they say it's outside of the Cowlitz's historical lands. "You can't take history and transport it to someplace else and then call it your own. And that's the difference here," says Rob Greene, the attorney for the Grand Ronde. "If they were doing this up along the Cowlitz River, we would be completely supportive of that." Tribal law expert Heidi McNeil Staudenmaier puts it this way: "In the case of a successful casino, location, location, location is everything." Staudenmaier, an attorney, is not involved in the dispute between the Cowlitz and the Grand Ronde tribes. But she says in order for the Cowlitz to establish this area as reservation land, they had to show some historical claim on the property. "They simply can't ask to have land designated in the middle of New York City or downtown Los Angeles without there being some sort of connection," she says. In the case of a successful casino: location, location, location is everything. And that's what this dispute comes down to: if built, the Cowlitz's casino will be just 20 miles from Portland right off a major interstate. The Grand Ronde's casino is 70 miles away, on a two-lane highway. Studenmaier says there are tensions across the country between tribes with gaming on long-established reservations and newer tribes with plans for casinos of their own. The Cowlitz got federal recognition in 2002, more than a decade after Congress authorized tribal casinos. Studenmaier says that gives them the advantage of being able to select their reservation based in part on whether it would be conveniently located for people looking to gamble. It's clear the Cowlitz's location will be good for business. Iyall says there is also meaningful link to this place. "We're here in our homeland, and so this is where we belong," he says. Iyall says the tribe is pursuing design work on the casino, but construction can't begin until the litigation is resolved. The case is before the U.S. Court of Appeals for the District of Columbia.